Georgia Health Sciences University scientists have devised a way to reduce lung cancer cells’ ability to repair the lethal double-strand DNA breaks caused by radiation therapy. Radiation therapy capitalizes on radiation’s ability to kill cells by causing double-strand breaks in DNA. But the fact that varying levels of radiation are essentially everywhere – food, air, the ground, etc. 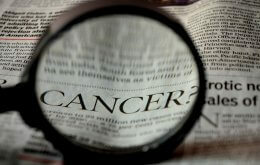 – means all cells, including cancer cells, have internal mechanisms to prevent the lethal breakage. GHSU scientists are targeting the natural defense mechanisms by packaging a piece of an antibody against one of them with folate, which has easy access to most cells, particularly cancer cells. Many cancers, including the lung cancer cells they studied, have large numbers of folate receptors so that cancer cells get a disproportionate share of the package. Previous efforts to destroy cancer cells’ ability to avoid radiation damage have focused on receptors on their surface, said Dr. Shuyi Li, molecular biologist, pediatrician and corresponding author on the study in the International Journal of Radiation Oncology. To get a more direct hit, the scientists took advantage of folate receptors as a point of entry by chemically binding folate with the small piece of their antibody, ScFv 18-2. The package heads straight for the cell nucleus where a different chemical environment breaks the bond, freeing ScFv 18-2 to attack the regulatory region of DNA-dependent protein kinase, an enzyme essential to DNA repair. “We are joining a targeting molecule with a cargo,” said Dynan. “This strategy targets one of the key enzymes so it’s harder to repair,” Li said. This makes cancer cells more vulnerable to radiation. Dynan and Li say the approach could be used to deliver any number of drugs directly inside cancer cells. Future studies include looking at other cell entry points as well as other targets to ensure they have the most effective package. Studies to date have been in human lung cancer cells in culture, so next steps also need to include animal studies. Their approach mimics a natural process called endocytosis in which cells engulf proteins and other substances they want to let inside but can’t fit through normal doorways. Folate receptors already are being used as direct entry points for chemotherapeutic drugs, including clinical studies of a new strategy for ovarian cancer. GHSU is participating in clinical trials of a therapy that pairs an agent too toxic to be delivered through the bloodstream with folate to better target one of the most deadly cancers. Dynan is the Georgia Research Alliance Eminent Scholar in Molecular Biology. Dynan and Li are both faculty members in GHSU’s Medical College of Georgia. Dynan also is a faculty member in the College of Graduate Studies.